Data. Does the word make you cringe? Does it evoke feelings of guilt? Are you unsure how to distill it and use it effectively? Grab this book and learn how to empower yourself and your school community with information gleaned from your school’s data. Experienced educators and authors offer simple instructions that can help focus school improvement efforts and result in increasing teacher expertise—a factor that positively affects the quality of life for students long after they have left the classroom. Accepting responsibility for such far-reaching influence requires educators to adopt instructional improvement as a standard by which a school needs to operate and as a means to collaborate and interact with one another. More than that, though, instructional improvement is an important component of successful schools. Collecting the right data—the right way. Incorporating relevant data into everyone’s daily life. Resisting the impulse to set brand-new goals every year. Anticipating changes—big and small, local and federal. Collaborating and avoiding privatized practice. Involving all stakeholders in identifying problems, setting goals, and analyzing data. Agreeing on what constitutes high-quality instruction and feedback. The challenge is to understand that data—not intuition or anecdotal reports—are tools to be used in getting better at teaching students. And teaching students effectively is what schools are all about. 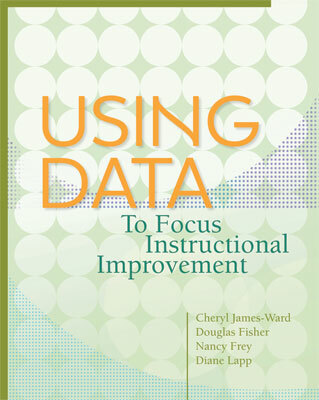 Following the guidance in this book, overcome uncertainty and concerns about data as you learn to collect and analyze both soft and hard data and use their secrets for instructional improvement in your school. CHERYL JAMES-WARD earned a bachelor’s degree in Applied Mathematics from the University of California at Santa Barbara, a master’s degree in Curriculum and Instruction from California State University Dominguez Hills, and a doctorate in education from the University of Southern California. She has served as both a principal and supervisor of schools for the Long Beach Unified School District. James-Ward is currently an assistant professor at San Diego State University and a leadership coach. Since 2003, she has coached more than 20 principals and assistant superintendents in districts throughout California. James-Ward may be contacted at cward@mail.sdsu.edu. DOUGLAS FISHER is a professor of educational leadership at San Diego State University and a teacher leader at Health Sciences High & Middle College. He is a member of the California Reading Hall of Fame and is the recipient of a Celebrate Literacy Award from the International Reading Association, the Farmer Award for Excellence in Writing from the National Council of Teachers of English, and a Christa McAuliffe Award for Excellence in Teacher Education from the American Association of State Colleges and Universities. Fisher has published numerous articles on improving student achievement, and his books include The Purposeful Classroom: How to Structure Lessons with Learning Goals in Mind; Enhancing RTI: How to Ensure Success with Effective Classroom Instruction and Intervention; Checking for Understanding: Formative Assessment Techniques for Your Classroom; and How to Create a Culture of Achievement in Your School and Classroom. He can be reached at dfisher@mail.sdsu.edu. NANCY FREY is a professor in the School of Teacher Education at San Diego State University and a teacher leader at Health Sciences High & Middle College. Before joining the university faculty, Frey was a special education teacher in the Broward County (Florida) Public Schools, where she taught students at the elementary and middle school levels. Frey later worked for the Florida Department of Education on a statewide project for supporting students with disabilities in a general education curriculum. She is a recipient of the Christa McAuliffe Award for Excellence in Teacher Education from the American Association of State Colleges and Universities and the Early Career Award from the National Reading Conference. Frey’s research interests include reading and literacy, assessment, intervention, and curriculum design. She has published many articles and books on literacy and instruction, including Productive Group Work: How to Engage Students, Build Teamwork, and Promote Understanding; Guided Instruction: How to Develop Confident and Successful Learners; and Better Learning Through Structured Teaching: A Framework for the Gradual Release of Responsibility. Frey can be reached at nfrey@mail.sdsu.edu. DIANE LAPP is a Distinguished Professor of Education in the Department of Teacher Education at San Diego State University (SDSU), has taught in elementary and middle schools. She is also an English/literacy teacher and instructional coach at Health Sciences High & Middle College in San Diego, CA. Lapp’s major areas of research and instruction regard issues related to struggling readers and writers, their families, and their teachers. Coeditor of Voices From The Middle, published by National Council of Teachers of English, Lapp has authored, coauthored, and edited numerous articles, columns, texts, handbooks, and children’s materials on reading, language arts, and instructional issues. She has also chaired and cochaired several committees for International Reading Association (IRA) and Literacy Research Association. Lapp’s many educational awards include being named as the Outstanding Teacher Educator and Faculty Member in the Department of Teacher Education at SDSU, the Distinguished Research Lecturer from SDSU’s Graduate Division of Research, IRA’s 1996 Outstanding Teacher Educator of the Year, and IRA’s 2011 Manning Award recipient for her work in public schools. She is also a member of both the California and the International Reading Halls of Fame. Lapp can be reached at lapp@mail.sdsu.edu.